No German-speaking city has been evoked... with quite the same topographical love and care. This installment of Vincent Kling’s translator’s diary takes a closer look at the multiplicity of integral components in Doderer’s work. From plot to setting to characters, Kling praises the complexity of Doderer’s masterpiece. Muriel Spark claimed she never revised; the first draft was always the one she submitted. As a translator, a fellow writer, that is—though one spared the burden of original, “from-scratch” invention—I wonder. Not every writer need agonize for hours over le mot juste, but if exhausting revision was an intrinsic part of the process for Yeats (“stitching and unstitching”) or Nabokov (“the strain and drain of composition”), then I can’t help doubting Spark. Yeats’s image pertains especially well to the translator, whose process requires extreme concentration; the craft of petit point is an apt comparison as the translator moves closer in to the text than perhaps any other reader, using a mental magnifying glass to study and replicate every tiny stitch of the original while keeping the whole design in view. I cannot be the only translator who wakes up from nightmares of having produced a dangling modifier or an ugly jangle of sound the Elizabethans would have called “too close chiming” or a tremendous blooper, like the famous translator—anticipating in reverse one of Oliver Sacks’s patients—who mistook a bowler hat (“Melone” in German) for a melon. I don’t believe it’s an overgeneralization to say that revising and revising again, second- and third- and fourth-guessing, reading aloud over and over for rhythm, intoning litanies of synonyms (miffed, peeved, irked, irritated, annoyed, etc. ad infinitum) are among the translator’s besetting obsessions and occupational hazards. It’s this very extremity of painstaking scrutiny, though, that has solved to my satisfaction a persistent mystery, illustrated by the quotation above, about readers’ responses to Die Strudlhofstiege. I’ll spell out the mystery later, but it has to do in general with the discrepancy between what Doderer’s novel appears to be and what it actually is, between the surface features for which it’s constantly lauded and strata lying just below and configured very differently. First, then, a summary of positive assessments—which can’t account for many readers’ puzzlement and rejection—and then a look next month at what the magnifying lens reveals. Doderer’s emphatic advocacy for the conventional novel with a beginning, middle, and end was an effective camouflage. Along with his resolutely tradition-minded critical writings, the novels themselves testify to a seemingly antiquated approach; many readers misjudge Strudlhofstiege as having been published decades before it was (1951). Nor was Doderer shy about disparaging Joyce, Proust, and above all Musil for essayism and showy-offy modernism. Partly at his encouragement, his plots, characters, and settings have all been read in the deceptive light of a solid, old-fashioned esthetic, especially in Strudlhofstiege. 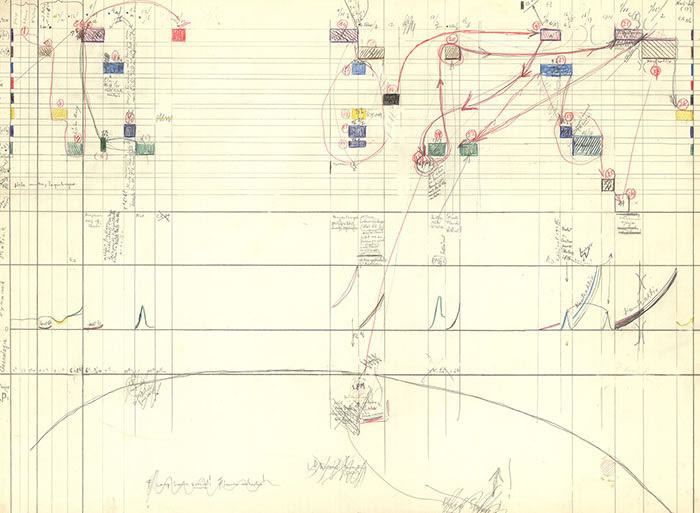 As for plot, Doderer carefully sketched the extremely complex, interlocking events on a drawing board (pictured above), enabling him to achieve the virtuosic feat of having his vast array of characters all step out independently of each other onto the same square at the same moment, when the climatic action occurs. Across three hundred pages he has given precise indications of time and location in every scene to chronicle this astonishing convergence with such skill that readers never even see it coming until it’s upon them, which places them in the situation of the accident victim whose mishap forms the climactic disaster—Doderer’s plotting is almost unrivalled. The characters range across the whole spectrum of society. From aristocrats to working people, from incorruptible civil servants to petty conmen and schemers, from happily married couples to sexual adventurers, from small shopkeepers to business moguls and banking plutocrats, with solid, educated upper-middle-class people predominating, every last character has his or her distinctive idiolect. Doderer lays out a panoply of types worthy of Chaucer or Balzac or Dickens (or Joyce)—droll or menacing, devious or naïve, brilliant or plodding, real deal or wannabe. The main character, Melzer, is often considered bland, but that may be only because others are purposely heightened, colorful Viennese “originals.” After meeting them, there is no forgetting Zihal, the Pastrés, Eulenfeld, Paula Schachl, the Stangelers, “the Tick,” “the Mosquito,” “the Red Field Ant,” or “the Soggy Dinner Roll” (these are nicknames for characters). The settings are a particular glory. Buildings, neighborhoods, streets; panoramas and pathways; parks and palaces are portrayed with a mastery that is uniformly praised. Last month I cited Paul Ellbogen; here is Ivar Ivask in the same vein: “No other German-speaking city has ever been evoked . . . with quite the same topographical love and care . . . as Vienna by Heimito von Dod­erer . . . Doderer’s Vienna is as ‘really real’ as the Paris of Proust, the Dublin of Joyce, and the Yoknapatawpha County of Faulkner.” A visitor could literally be guided from place to place by the descriptions in the novels alone. (This has been field-tested by myself and many others). So what’s this about hanging ourselves? Wouldn’t readers flock to a novel with such engaging attributes? After all, Strudlhofstiege enjoys cult status, enthralling readers who treasure its droll humor, irony, and vividness. Yet even passionate admirers often admit they initially become bogged down and had to restart several times. And those are the advocates! There is probably no other novel—none, not The Man without Qualities, not The Death of Virgil, not Ulysses, not The Sound and the Fury—that so many have hopefully started but soon abandoned. I wish there were a way to measure that assertion quantitatively, but I have met an unusually large number of alert, intelligent readers who said they couldn’t get beyond the first hundred pages, if that many. Rambling, self-indulgent, formless, maddeningly digressive: these are frequent responses, often made in an offended or even indignant tone by people who act as if they’d somehow been hoodwinked. Whereas readers who abandon other novels often feel mildly shamefaced about not finishing, many who give up on Strudlhofstiege react irately. “Why am I being told what I’m being told?” asked one reader, a friend with keen literary discernment, after encountering early on a long passage about how men in 1910 generally wore suspenders but by 1925 (the two time periods of the novel) had taken to wearing a belt. The long passage is capped by a series of mock-sententious remarks about how the wearing of suspenders or a belt is a reliable indicator of a man’s character. “That’s when I lost it and put the book away, literally tossed it aside,” said my friend. The assessment of Strudlhofstiege as a kaleidoscopic portrayal of people, places, and things—grippingly social, documentary, almost photographic, a realistic achievement on the grand scale (and it is all that, to be sure)—has encouraged misleading but persistent comparisons with Musil’s The Man without Qualities and Broch’s The Sleepwalkers. These comparisons create expectations that will inevitably be thwarted, because the pedigree is false. Musil and Broch draw on modernist technique but remain essentially realist at heart—even The Death of Virgil is largely a sequential narrative, though interiorized. By contrast, Doderer’s method is realistic on the surface but highly and unexpectedly experimental underneath. Stay tuned for more from Kling’s translator’s diary next month! 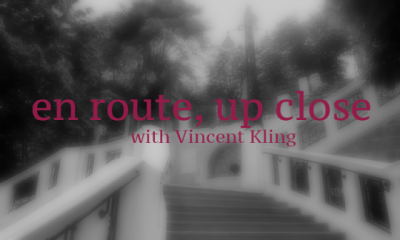 Herewith, the second installment in our newest monthly column by past Asymptote contributor Vincent Kling, winner of the 2013 Schlegel-Tieck Prize. As he translates the 909-page Heimito von Doderer’s Die Strudlhofstiege for New York Review Books, he’ll take us along for the inevitable twists and turns of his process. If you didn’t have a chance to read his first installment, check it out here! “Peru.” Honesty begins at home. I balance my vehement defense earlier about preserving rhyme with a set of true confessions now, acting as my own devil’s advocate by pointing out choices that could be seen as fudging, padding, patching, cheating—all of which might argue against translating rhyme. “Peru” in a bit, after working to it from another clarifying example. In one of his novella-length stories, Doderer has a character attend a performance of Beethoven’s Fidelio, and he includes a few lines from Leonore’s great solo in Act 1. Der hell auf dunklen Wolken ruht. Rests on gray clouds above the flood. With new-found calm now flows my blood. Ludwig Wittgenstein or Karl Kraus would have my head for tautologies alone: clouds are of course above the flood—where else? ; there’s nothing about a flood in the original anyway (but something had to rhyme with “blood”); can an image be “keenly” mirrored, instead of “sharply”? ; doesn’t the displacement of the subject in the last line make the word order cheesily “poetic”? In a work of art, sound and sense, content and form, can’t be separated. Today, we are thrilled to introduce a new monthly column by past contributor Vincent Kling, winner of the 2013 Schlegel-Tieck Prize. Making his way through his current project—translating Heimito von Doderer’s 909-page Die Strudlhofstiege for New York Review Books, he generously shares with us some thoughts on the process from up close. In this first instalment, he tells us how he got started—and restarted—on this translation, and gives us a taste of the entanglements to come. No translator’s dream is worth much unless it’s a nightmare as well. The craft requires compromise, meaning necessary loss. Those who argue for the intrinsic untranslatability of literature have a point, but it’s valid only in part and never seems to stop anyone. A rule of thumb (or maybe thumbscrew, considering the toil), is that if the effort doesn’t both drain and recharge at once, it’s probably not genuine. Still, Klaus Reichert’s extensive experience has taught him that the eureka moments and the rare flashes of just-right rendering compensate for the drudgery and frustration. Remembering that makes me stop my pity party and resume work after praying to my patron saints—Constance Garnett and Jean Starr Untermeyer; C. K. Scott-Moncrieff and Archibald Colquhoun. A door to my current project opened again when a major award, the Schlegel-Tieck Prize, came my way unexpectedly a few years ago. I’d been translating for decades and had been working on Heimito von Doderer’s Die Strudlhofstiege oder Melzer und die Tiefe der Jahre (The Strudlhof Steps or Melzer and the Depth of the Years) in the early 1990s, only to have the publisher go bankrupt. (The title names an elaborate, beautiful public staircase in Vienna that becomes the novel’s main objective correlative.) Half of the long novel (909 pages, about 360,000 words) was finished, all ready to go but no place to go to, since Doderer’s disastrous reception in the early 1960s (Alfred A. Knopf called The Demons “our colossal failure”) made him publishers’ poison. But Edwin Frank of New York Review Books must be immune; his passion is the antidote, here as in so many other cases, so he sought me out in 2014 and asked me to finish my translation.